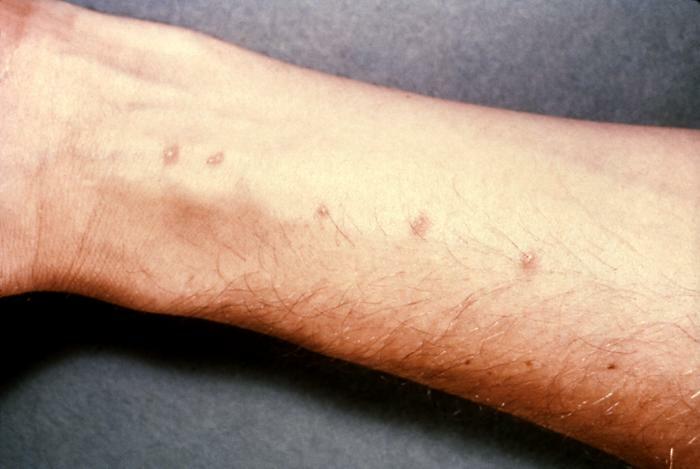 This image depicts a close view of the volar surface of a patient’s left forearm, revealing the presence of a number of cutaneous pustules that proved to be a condition known as swimmers’ itch, which occurs when skin is penetrated by a free-swimming, fork-tailed, infective schistosome cercariae. Upon release from the snail host, the infective cercariae swim, penetrate the skin of the human host, and shed their forked tail, becoming schistosomulae. The schistosomulae migrate through several tissues and stages to their residence in the veins.